Please support our website and CHS Alumni activities! Donations of any amount are always welcome to keep our website FREE for everyone to use. Thanks to volunteers who manage the site, our costs are low. Any extra funds are donated to CHS for items needed for today's students. Please click the Donate button below to contribute. Donations can be made by PayPal, or with a regular credit card. Or you may save us the PayPal fees by sending a check - see Membership page. THANK YOU FOR YOUR SUPPORT of your CHS Alumni Society! Use of this website is always FREE! JOIN NOW by finding your name on your Class Roster. If your name is not listed, but you attended Claremont High School in Claremont, CA, please Contact Us to be added. Even if you left before graduation, you're welcome Back to the Pack! Once a Wolf, Always a Wolf! Be sure to scroll all the way to the bottom so you don't miss anything! LOG IN for access to all the pages. Are you Getting too many email notifications? Go to "Notify Me" to set your preferences for what emails you wish to receive. for log-on instructions & helpful tips. 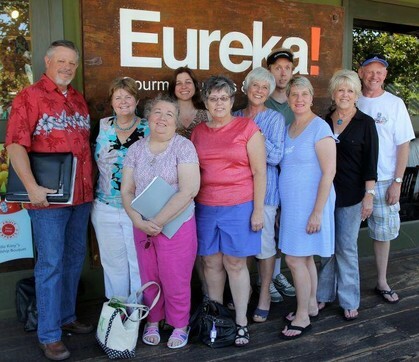 If you're planning a reunion, Contact Us so we can add it to the website! Rooms have been reserved at The Doubletree in Claremont for the reunion weekend. $169+tax/night. The CODE for the special rate is CHR. There are 10 rooms currently reserved. One king or two double beds. Get your room reserved or stay with your parents...it's up to you. NOW is the time to join or renew your Membership in the Alumni Society for the new year 2014-15 to support our activities & expenses for the coming year. Our Membership Year is July 1-June 30 to coincide with the school year. Use of the website is ALWAYS FREE and your $20 Membership dues are voluntary but VERY much appreciated! Any funds remaining at the end of each year are donated to CHS: we have given over $4,500 to the CHS Theatre in past years in addition to donating bronze plaques to honor our CHS Veterans and the CHS Centennial, and purchase of a new patio table for the students. Go to the MEMBERSHIP page for details & the Membership Form. Your Member benefits include listing on the website, an Alumni Member pin, occasional gifts, unlimited hugs & bragging rights! 1. Class Detective - at least one person in each class who will make sure your class roster is complete, correct & up to date! This means proofreading names, looking for duplicates, adding married names, confirming names for Memorial pages. No computer skills needed - just review your Class Roster & Contact Us with changes. Having a police background is helpful & inquiring mind essential! 2. Scanner - to SCAN yearbooks. You must have a good scanner & time to carefully copy our CHS annuals. Should live in or near Claremont for access to the books at CHS. 3. Marketing Experts & Social Networkers - to help get the word out to alumni about the Alumni Society & website! Do you use Twitter, Instagram, Facebook, Bebo, Google Plus, Yahoo Groups, Tumblr, Meetup or other social media? Please cross-post our website link & event announcements! Click on Class Connection under Member Functions in the left column & join the facebook app tied to our website! Invite your CHS Family & Friends to join us on facebook! 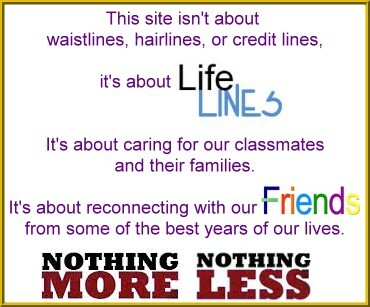 See Yearbooks & Websites for more links to individual class websites & facebook pages. Click for a Stroll Down Memory Lane! Click Take me Back to the 50's! A TEST: Click Do You Know What This Is? Did you miss out on high school graduation? Ken Hargrove, our CHS Veterans Coordinator, has introduced Operation Recognition, a California State program to grant retroactive diplomas to eligible CHS Veterans who were prevented from graduating from their home town high school. 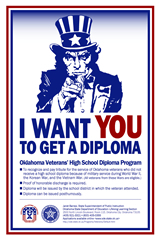 Veterans must show proof of Honorable Discharge and active pursuit of CHS curriculum prior to military service. If you or a CHS alumni family member qualifies, please Contact Us to notify Ken. The Claremont Unified School District Board of Education will present diplomas to eligible individuals. 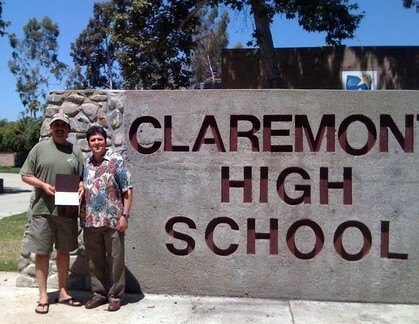 Richard Bonilla (1974) (left) is the first CHS Veteran to receive his CHS diploma from Operation Recognition, presented by CHS Principal Dr. Brett O'Conner. Richard served in the US Navy. Congratulations, Richard! Click for Inland Valley Daily Bulletin full story. With over 1,600 Alumni registered, our website is a great networking tool for CHS Alumni. EVERYONE - INVITE A WOLFPACK FRIEND TO REGISTER! Well, not a lot, but your $20 donation supports our events and your school, and you get bragging rights and a hug. 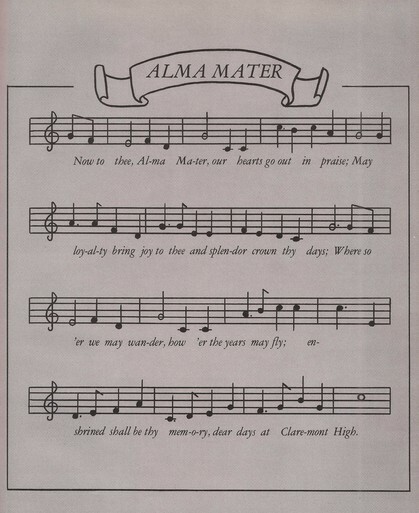 To become a Member of the Alumni Society, see Membership for details. YOUR contributions helped make this happen! THANKS to you ALL for supporting the CHS Theatre! Wolfpack Alumni Society featured in CHS 2012 Yearbook! See Yearbooks & Website for the full spread! And see if YOUR El Espiritu is available to view! No Excuses - Send us your news or update your profile! Musician & Singer Ben Harper! Former Ambassador to Pakistan Cameron Munter! Emmy Award Winner Sheldon Altfeld! Click headline to read about these famous Alumni & more! Check out the amazing accomplishments of some of our alumni: community leaders, sports heroes, film & TV stars, pilanthropists and more. to see complete yearbooks. More to come! have been added to individual profile pages for many classes, too! Check out the early years for great historic pix! Is Grandma or Grandpa a CHS Alumni? You can probably find them here. This is still a work in progress to get all 100 years of photos scanned. Patience is a virtue! Got somewthing to say? This is your place to participate in the website & several topics were suggested in the survey. Click REPLY to comment on a topic that interests you, or go to Post New Topic to change the subject. Hot Rods 'n' Wheels - post pix of your hot car or motorcycle in high school - or since then! Community Involvement - what charitable or enrichment projects are our alumni doing? Lost & Found - looking for your BFF or old boyfriend? Post searches here in case someone knows where they are! Or write about the one you've just reconnected with! 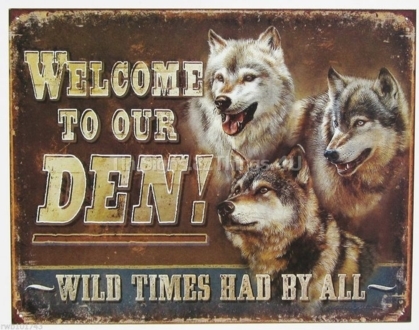 Mini Reunions - Planning to be in town & want to meet up with Wolfpack friends for dinner or drinks? Post your plans here! TIP: Are you getting too many Profile Update emails? Just go to Notify Me in the left column, to check only the classmates you want to get notices about. This should save your Delete button from wearing out! 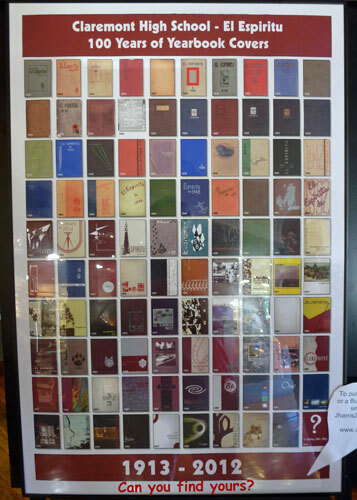 The 2012 CHS Yearbook Team created a poster depicting every CHS yearbook cover from 1913 to 2011 in celebration of the CHS Centennial year. The price is $10 if you pick it up at CHS. Not only did we have a wonderful, fun 2011 ALL-Alumni reunion, we actually made money! On behalf of the CHS Wolfpack Alumni Society, on November 17 we donated $3,500 to the CHS Theatre Renovation Project – which means $7,000 for the project with the matching grant from the State of California! Thank you for all your help to make the CHS Alumni Society a success! Please spread the word for other alumni to log onto the website for connections, news and Alumni activities! YOU CAN JOIN to help plan the FUTURE of the ALUMNI SOCIETY! If you are a Veteran or active Military, please complete the Veterans' Survey & send a photo of yourself in uniform & any additional information or service photos you’d like to share. If you have any information about other classmates’ military service, we would welcome that as well. What family has the MOST CHS alumni family members spanning the longest period of time? Who and where is the OLDEST living CHS alumnus? Please include the full name, grad year, age and location. Please go to Alumni Chat/Oldest Alumni? Most Family Alumni? to see the list & post your reply. PLEASE upload your reunion photos in Photo Galleries. We have Galleries for recent reunions of the classes of 1961, '69, '71, '77 & '81. Upload videos to YouTube & send me the link to add to the website, or mail me a DVD. If you have a yearbook from any of these years that you're willing to donate to Claremont High School, please send it to Principal Brett O'Connor, 1601 N. Indian Hill Blvd, Claremont, CA 91711 to help preserve the history of our Alma Mater! 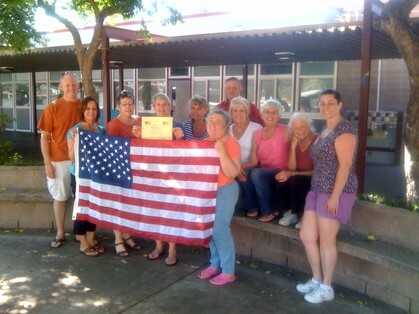 The CHS Alumni Society arranged for a flag to be flown over the US Capitol on September 2, 2011 in honor of the 100th anniversary of the dedication of the original CHS school building, and donated it to CHS. at the 2011 Homecoming game!! THANK YOU for your support of the CHS Wolfpack Alumni Society! please note that this is NOT from us! Alumni Archive, Alumni Junction and Alumni Class are out to get your money. They are NOT affiliated with Claremont High School or our CHS Alumni Society. You can Google Alumni Archive Complaints and Alumni Class Complaints to read more. DO NOT PAY unless you want to join that site, which is NOT affiliated or sanctioned by Claremont High School! If you did send them money, you can request a refund or reverse the charges with your credit card company. DO NOT GIVE email addresses of your friends or classmates to others. They use them to solicit money. Our website NEVER releases personal information to third parties. The CHS Alumni Society website belongs to YOU, CHS Alumni. It will always be FREE to use & has no ads or pop-ups. Those alumni who wish to support our organization by making a $20 donation may become Members (see Membership). Do not send money to any other organization purporting to be an official CHS Alumni group unless you know who they are. For links to existing CHS Class websites, click Class Links/Websites. Feel free to Contact Us with questions! All contact information (address, phone number, e-mail address) entered into this website will be kept confidential. It will not be shared or distributed.Your contact information is private: your street address, e-mail address, and phone number cannot be seen by the classmates unless you grant permission on your Profile. When someone clicks on your name, the only contact information they will see is your city and state and whatever information about yourself you choose to put on your Profile. Unless you explicitly grant your permission, your email address is not visible, although an email can be sent to you using the contact box at the bottom of your Profile page. 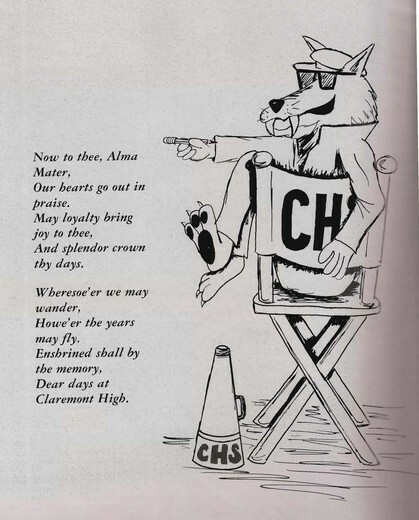 This website is managed by volunteer alumni of Claremont High School, Claremont CA, to promote the Wolfpack Alumni Society and provide information about CHS Alumni activities. There is absolutely no charge for CHS alumni to use this site or be a member of the Wolfpack Alumni Society. This is a private site for Claremont High School Alumni. Classmates that did not graduate with their class are also welcome. All membership, regardless of graduating year, will be granted or denied, at the discretion of the site administrator. All memberships may be revoked at the discretion of the site administrator. The privacy and security of all registered members will be considered a priority for the purpose of invitations, admittance, denials and revocations. NOTE! This multi-year site is not intended to replace any individual class site. This site gives alumni whose class doesn't have its own site a place to connect with others of their class. In addition, this multi-year site gives ALL alumni the opportunity to connect with friends from other classes and even check out family members who were students at CHS through the years. For those of you with spam blocking or email filtering capabilities, please add noreply@classcreator.net (that's.net, not.com) to your email account as a safe sender in order to receive email communication from this web site. We do not want to receive "bounce back" emails and don't want you to miss receiving emails from other classmates. The website is intended for reconnecting with old friends and making new ones. All of us welcome and encourage your use of this site to share memories and stories as well as providing updates on your lives since leaving Claremont High School. Please use good judgment when posting messages and photos. Personal attacks, inappropriate pictures, postings or videos, as well as offensive language will be removed immediately by the website administrators at our discretion.